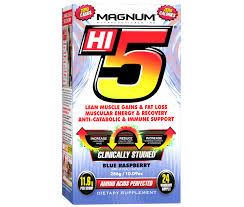 Muscular energy, anti-fatigue, anti-catabolic, maximized blood flow to working tissue, improved recovery, and an enhanced immune system are all actions that set Magnum Hi-5 at the top of the amino acid category. But even beyond Hi-5s amazing functions is its groundbreaking, top of the food-chain ingredient profile, and raw material selection. Every ingredient in Hi-5 is not only Pharmaceutical Grade, but every amino acid comes exclusively from fermentation. This means zero human hair or bird feather derived amino acids were used when manufacturing Hi-5. Yes, you read that correctly, amino acids usually are derived from human hair and bird feathers, and that human hair has been known to come from prisoners in far off lands. We manufactured Hi-5 with 100% fermented amino acids because we care about what we put in our bodies and we know that Magnum customers care as much as we do.